Located in the Glitter Bay resort on the west coast of Barbados, this two-bedroom condo is modern and spacious, enjoying all the facilities and beautiful green spaces of the resort. 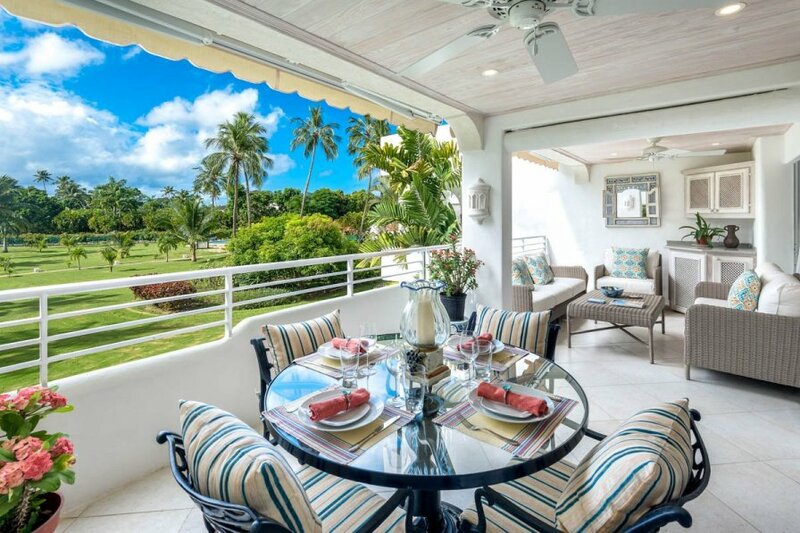 Located in the Glitter Bay resort on the west coast of Barbados, this two-bedroom condo is modern and spacious, enjoying all the facilities and beautiful green spaces of the resort. You have the peaceful beach nearby, as well as a large swimming pool and tennis court, at this popular destination just north of Holetown. The property incorporates more than 1300 sq ft of living space, including a covered terrace which looks out over the expansive, palm-fringed gardens. You have relaxing areas here to sit and chat, or dine around the table, and it all flows seamlessly from the indoor living area, equipped with ceiling fan and air-conditioning for supreme comfort. You have cable television and two inviting sofas to chill out on at Glitter Bay Apartment 212. A fully equipped kitchen is just a few steps away, with a large fridge freezer, oven, microwave and dishwasher as well as small appliances including a kettle and toaster. The apartment features two bedrooms, each with a ceiling fan, television and air conditioning. The large master bedroom has its own balcony accessible via sliding doors, a king-size bed and an attractive en-suite bathroom. The second bedroom has twin beds which can be converted to a king-size if needed. With the ocean and pool just a short stroll from your door, Glitter Bay Apartment 212 brings you close to the water, and the calm seas are great for swimming and snorkelling. When you want to chill in the sun, you'll find lounger chairs and parasols waiting for you – the beach attendant will reserve a spot for you to use throughout your stay, so there's no need to rush. The resort also offers a gym, tennis court, bar and restaurant, and you will find many more of these in the area near the complex too. Around 2km south of the resort, Holetown is the place to go to sample Bajan cuisine, take a stroll along the boardwalk or experience some vibrant nightlife. You can head to Holetown Beach as well, where you'll find tranquil waters lapping golden sands, and a variety of beachfront restaurants. Glitter Bay Apartment 212 is a 2-bedroom condominium, within the Glitter Bay Complex. You will find many of the other visitors enjoying themselves at the communal swimming pool or making the most of the beach which is a short stroll from this apartment. On the upscale west coast of Barbados, the Saint James parish is known with good reason as the island's ‘platinum coast'. Aside from being a celebrity hangout, the area is famed for its beautiful white sand beaches, various golf courses and excellent dining options, as well as luxury brand shopping. One of the area's main towns, Holetown, is a good place to get acquainted with what Saint James has to offer. The Limegrove Lifestyle Centre brings shopping and entertainment together, with dozens of high-end stores, a multi-screen cinema and regular live events, from music concerts to art shows and craft fairs, while colourful Chattel village sets its shops in scenic tropical gardens. The beachfront walks are another highlight, and particularly spectacular if you happen to be there at sunset. Eateries like Zaccios and Tides occupy some of the prime ocean-view locations, and with views like those, chances are you will want to try them out. Holetown's big annual event comes around each February – the Holetown Festival is a commemoration of the first settlement on the island in 1627. It's a broad and lively celebration, encompassing everything from fashion shows and beauty contests to vintage car parades, sporting events and a Police Tattoo, and it's a great opportunity to sample Bajan delights like macaroni pie and Barbados rum. The town is also a centre for nightlife, concentrated mainly on Holetown's First and Second Streets. Cool hangouts like the Red Door Lounge prove that Barbadians know how to party, and are very happy for you to join them. Head south of the town and a string of stunning beaches like Sandy Lane and Payne's Bay await you, and it won't be long until you find yourself in Bridgetown – the historic capital city is just 11km from Holetown.